Plug in your GPS , type in 'Willow Glen Meats & Smokehouse', buckle your seat belt and hold on because we are going on a Meat Adventure. We are traveling from the North Bay to the South Bay. The Bay Area freeways have a window of time to travel relatively traffic free. The first stop will be Cathoula's to fuel up on java. One hour later we have arrived in San Jose. The GPS guides me through an older residential neighborhood. The houses are tidy and well kept. We have arrived at our destination. The cartoon pig welcomes us and I can smell smoke wafting through the air. The saliva glands are starting to kick in. There are a couple of customers ordering deli sandwiches, so I have a little time to window shop. This Meat store has something for everybody. Hams, bacons, jerky, sausage are all displayed. 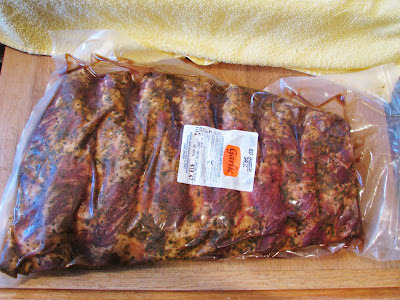 Tri-tips, roasts and ribs are marinated and shrink wrapped are offered. Some condiments are for sale. The clerk finished making the sandwiches and asked If I need help. 'Yes, I need help' (Okay, that is not funny). After I introduced myself as the Mad Meat Genius she ran away and got the manager. 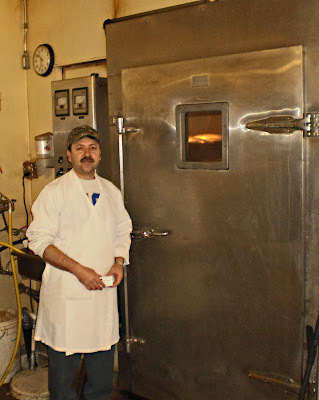 Fabel Caraves was the manager/head butcher. He was very nice. 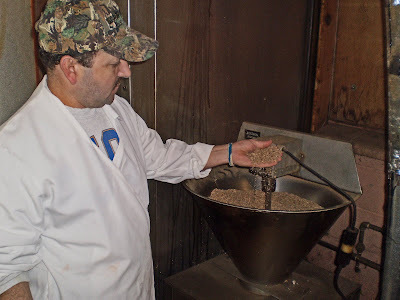 He showed me around the smokehouse. He showed me the sausage grinders, stuffers and lots of implements of the trade. The smoker was impressive. It was fueled by hickory sawdust. You could smell it through out the store. This was an older meat market. It had the old massive steel track down the middle of the plant to the walk in refrigerator.This was for hanging carcasses of meat to be suspended by hooks. Fabel showed me the walkin. It had 3 wild boar hanging and waiting for preparation. While getting this private tour, it was noticed the pride and enthusisaim that Fabel showed for his operation. You just know that this will transfer to his food products. It was time to travel bach home. We loaded up the car with purchased meat products. I need to get a bigger car. The ride home was smooth sailing. One is always a little amazed to circumvent the bay with out hitting traffic. Once home the bounty was sorted and put away in the Chilebrown Ice Cave. We did save some garlic marinated beef ribs for the grill. 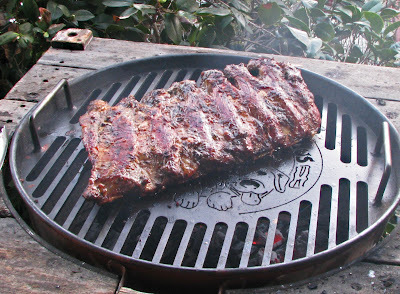 Willow Glen tumbles the ribs with the marinade to flavor and tenderize. These ribs were tender and garlicky good. 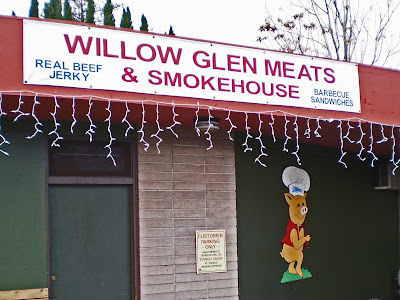 Willow Glen Meats & Smokehouse is a great place to find smoked meats and house made sausage. The prices were very reasonable. If you are a hunter they will process your game. Today was a great day for a Meat Adventure. Great post. I sure wish we had someplace around here. I'll have to Google and find out. I'd be like you and fill up the car. There's nothing like having a nice meat market within driving distance... wonderful they have their own smokehouse! highlandsranchfoodie, You may not say great post tomorrow when I mention the barbeque sauce from Denver. Just a hint. The sauce was actually very good. Zia, There are a handful of smokehouses left in the Bay Area. It is a dying art around here. It is a shame, because it is so good.